Polar is a fantastic example of an enjoyable but terrible movie. Lacking anything in terms of conventional positives, Polar is best enjoyed on a drunken evening laughing with your friends at how silly Matt Lucas looks in his bright yellow suit. You won’t remember it but you’ll probably have fun with it if you don’t take it too seriously. Drawing on his music video experience, Jonas Akerlund directs the latest Netflix original feature Polar starring Mads Mikkelsen and Vanessa Hudgens. Even with a few solid action scenes the film barely manages to stand on its highly stylised legs with a weak plot, over the top villains and extremely over saturated colour pallet. 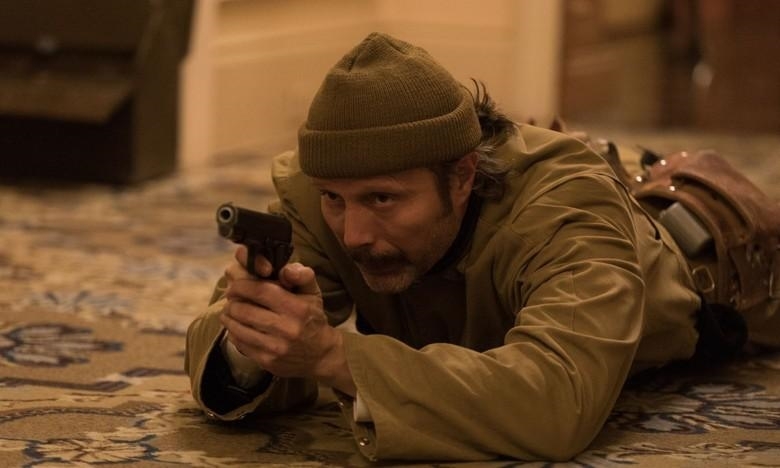 Aside from Mads Mikkelsen’s deadpan performance there is very little to enjoy here for the average movie-goer, however fans of over the top violent exploitation cinema films will probably find a lot to like here. 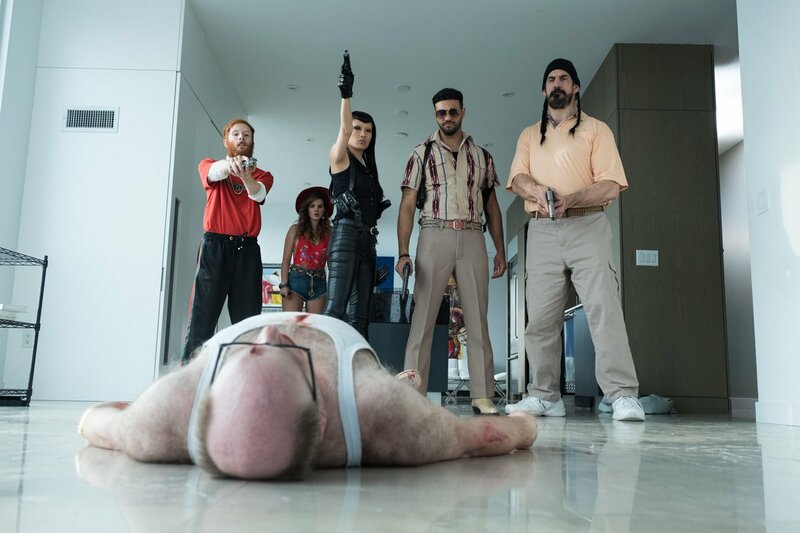 This is not a film to be taken seriously in the slightest and is likely best experienced with a few intoxicated friends laughing at how ridiculously silly the entire show is. Mads Mikkelsen plays Duncan Vizla, the greatest assassin in the world. Approaching the mandatory retirement age of 50, Vizla is sent on one last job which reveals a greater conspiracy that threatens to end his own life. He lives in a quiet and cold corner of the world opposite the young woman Camille, portrayed by Vanessa Hudgens, with whom he develops a friendship with over the course of the film. Out to take Vizla’s life is his former employer Blut, played hilariously by Matt Lucas who wears a bright yellow suit whilst conducting his nefarious schemes. All the performances service the plot and the tone well even if neither of those things are particularly well done in their own right. Each actor was clearly given a loose scaffold of their character’s history and motivations and then allowed to freely play them as they pleased. 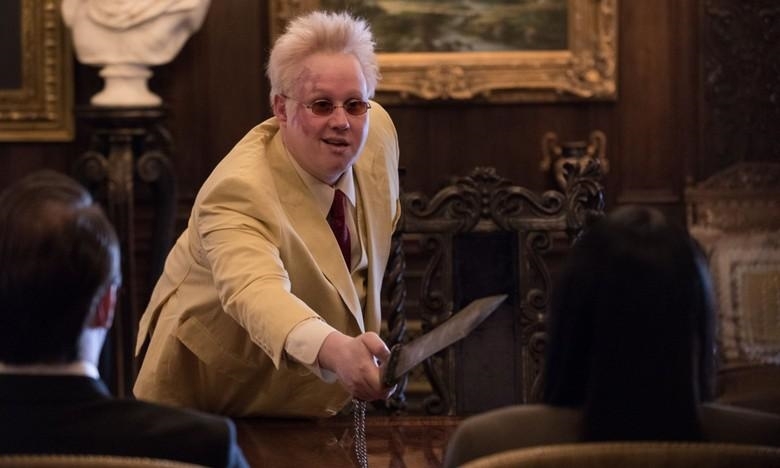 The wonderful thing is that Matt Lucas is a joy in anything that he pops in and he’s definitely the funniest part of the film. It would be a stretch to say that this film is meant to be a comedy but it is certainly far too over the top to be taken seriously. The action scenes throughout the film are entertaining at best and mediocre at their worst. Duncan is never really in any particular danger as he seems to literally have a foresight into where exactly every adversary is going to be before they are there allowing him to always be a step ahead of his hostiles. Whilst choreographed well the action is not particularly engaging as there is never any tension because Duncan is always winning. Even in the climatic action sequence in the third act Duncan ploughs through hordes of armed guards in his underwear as though they were simply lining up waiting for him to kill them. We’ve seen much better action of this style done in franchises such as John Wick (Chad Stahelski) and so the resulting pay off in this film is completely unsatisfying. 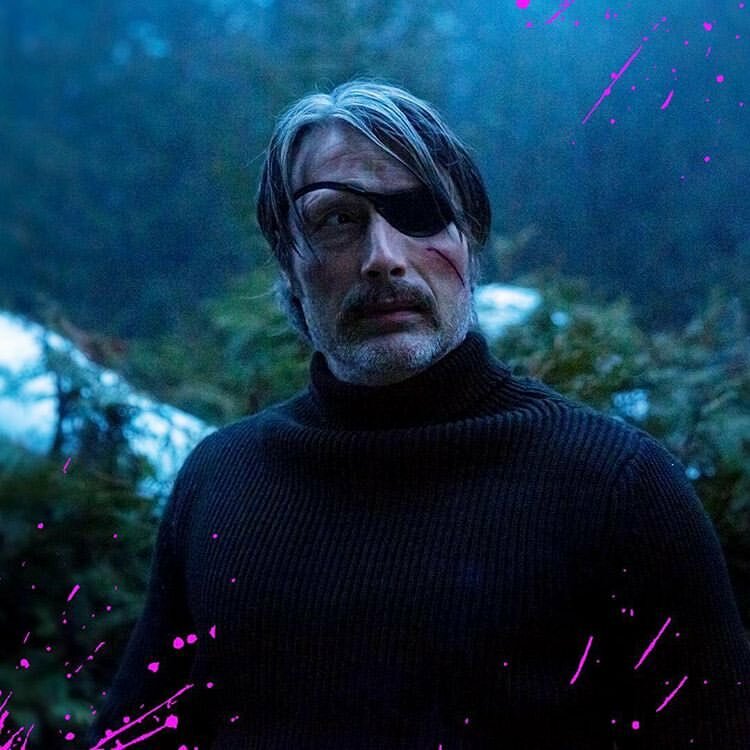 However if you turn your brain off and just want to watch Mads Mikkelsen brutally murder lots of people, often not wearing any clothes, then you will enjoy this. The one thing that really grinds in terms of the visuals however is the over-saturated colour pallet, a common issue with music video directors taking on feature films. A lot of the scenes are simply just difficult to look at because of the bright greens and reds that dot around the screen. Every character looks awful and unappealing and the high volatile, fast paced nature of the action makes it simply uncomfortable to watch in the worst way possible. This is the kind of film that would be on your list if you were having a terrible movie marathon which is its major strength. Many films can fall into categories of either being good, average or bad but some unique films can negate that style of rating and become so uncomfortably unpleasant that it becomes entertaining in itself to not enjoy it. We’ve seen it before with films such as The Room (Tommy Wiseau, 2003) and the vast number of Sharknado films. We enjoy them because they are bad and because they shouldn’t be taken seriously. I’m not saying that Polar is as bad as The Room but it certainly isn’t far off. So if you’re looking for a high octane, terrible but enjoyable action film to watch on a drunken Sunday afternoon with your friends in which you can all sit around and laugh and Matt Lucas’ hilarious performance in this film then you will enjoy it. If you’re looking for anything else, you absolutely won’t.